Online communities are wonderful for sharing ideas, searching for support, and creating a sense of camaraderie. However, it's nice to put a face with a link. You've heard me talk about the Arkansas Women Bloggers, right? If you're new here, I'll fill you in. It's a community of ladies who come together on the basis of owning a blog to let friendships bloom and learn lessons daily. We encourage new content by participating in blogging challenges, we answer questions for one another and improve our technological knowledge, and we boost the spread of our online brands by sharing posts. We grow, gather, and connect, as it were. Every year, many of these women converge for a state-wide blogging conference to get to know the faces behind the screens. This year's event was in September and although I was interested in attending, I wasn't ready to leave that new baby of mine. That being said, I was so pumped when Karen over at Ting's Mom contacted me about a subgroup focused on the southwest corner of the state. Several people joined and we actually held our first meetup last weekend. It was so fun to actually talk to people who understand blog talk - let alone know what the word "blog" even means. We were just a collection of writers, sharing lunch and talking shop. It was awesome and I can't wait to do it again. I know there are plenty of other bloggers in our little corner and I hope to see new faces when we do this again in a few months. 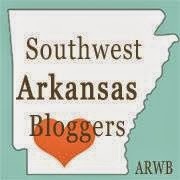 If you or someone you know is a Southwest Arkansas Blogger, we would love for you to join us. Provide your information on the group's Web site and you'll be added to the directory. You can also click here to visit and "like" our Facebook page to keep up with what we're doing. Now, don't you have some new blogs to read and plenty of links to click? Have a spectacular weekend, everybody! Thanks! It was great to finally meet you last weekend. Looking forward to our next meet-up. Great post! :) I agree -- can't wait!